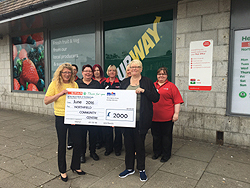 SPAR Northfield, owned and operated by CJ Lang and Son Limited has recently donated a generous £2000 to Northfield Learning Association. 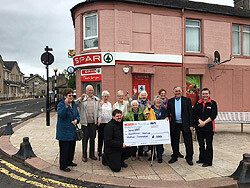 SPAR Stonehouse, owned and operated by CJ Lang and Son Limited has recently donated a generous £500 to the Stonehouse Old Folk Welfare Committee. A number of CJ Lang and Son Limited SPAR stores recently supported two tutu-wearing tandem cyclists on their journey from Land’s End to John O’Groats which they completed to raise money for charity. 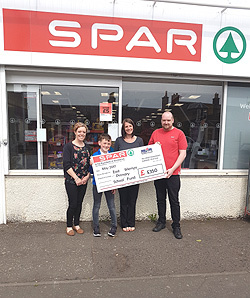 SPAR East Wemyss, owned and operated by CJ Lang and Son Limited has recently donated a generous £350 to East Wemyss Primary School.